“If one does not know to which port one is sailing, no wind is favorable.”- Lucius Annaeus Seneca.Letters from a Stoic still holds the power to enthrall. The epistles were written by Seneca at the end of his life, during his retirement, after he had worked for the Emperor Nero for fifteen years. They are addressed to Lucilius, the then procurator of Sicily, although he is known only through Seneca's writings. Whether or not Seneca and Lucilius actually corresponded, or whether in fact Seneca created the work as a form of fiction, is not clear from the historical record.This is the third volume of the Letters, Epistles Letter XCIII - CXXIV. 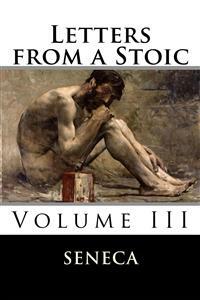 Letters from a Stoic: Volume III. By Lucius Annaeus Seneca. Translated by Richard Mott Gummere. First published in 1925. This edition published by Enhanced Media, 2016. While reading the letter in which you were lamenting the death of the philosopher Metronax as if he might have, and indeed ought to have, lived longer, I missed the spirit of fairness which abounds in all your discussions concerning men and things, but is lacking when you approach one single subject, – as is indeed the case with us all. In other words, I have noticed many who deal fairly with their fellow-men, but none who deals fairly with the gods. We rail every day at Fate, saying "Why has A been carried off in the very middle of his career? Why is not B. carried off instead? Why should he prolong his old age, which is a burden to himself as well as to others?" But tell me, pray, do you consider it fairer that you should obey Nature, or that Nature should obey you? And what difference does it make how soon you depart from a place which you must depart from sooner or later? We should strive, not to live long, but to live rightly; for to achieve long life you have need of Fate only, but for right living you need the soul. A life is really long if it is a full life; but fullness is not attained until the soul has rendered to itself its proper Good, that is, until it has assumed control over itself. What benefit does this older man derive from the eighty years he has spent in idleness? A person like him has not lived; he has merely tarried awhile in life. Nor has he died late in life; he has simply been a long time dying. He has lived eighty years, has he? That depends upon the date from which you reckon his death! Your other friend, however, departed in the bloom of his manhood. But he had fulfilled all the duties of a good citizen, a good friend, a good son; in no respect had he fallen short. His age may have been incomplete, but his life was complete. The other man has lived eighty years, has he? Nay, he has existed eighty years, unless perchance you mean by "he has lived" what we mean when we say that a tree "lives." We should therefore praise, and number in the company of the blest, that man who has invested well the portion of time, however little, that has been allotted to him; for such a one has seen the true light. He has not been one of the common herd. He has not only lived, but flourished. Sometimes he enjoyed fair skies; sometimes, as often happens, it was only through the clouds that there flashed to him the radiance of the mighty star. Why do you ask: "How long did he live?" He still lives! At one bound he has passed over into posterity and has consigned himself to the guardianship of memory.
. And yet I would not on that account decline for myself a few additional years; although, if my life's space be shortened, I shall not say that I have lacked aught that is essential to a happy life. For I have not planned to live up to the very last day that my greedy hopes had promised me; nay, I have looked upon every day as if it were my last. Why ask the date of my birth, or whether I am still enrolled on the register of the younger men? What I have is my own. Just as one of small stature can be a perfect man, so a life of small compass can be a perfect life. Age ranks among the external things. How long I am to exist is not mine to decide, but how long I shall go on existing in my present way is in my own control. This is the only thing you have the right to require of me, – that I shall cease to measure out an inglorious age as it were in darkness, and devote myself to living instead of being carried along past life. And what, you ask, is the fullest span of life? It is living until you possess wisdom. He who has attained wisdom has reached, not the furthermost, but the most important, goal. Such a one may indeed exult boldly and give thanks to the gods – aye, and to himself also – and he may count himself Nature's creditor for having lived. He will indeed have the right to do so, for he has paid her back a better life than he has received. He has set up the pattern of a good man, showing the quality and the greatness of a good man. Had another year been added, it would merely have been like the past. And yet how long are we to keep living? We have had the joy of learning the truth about the universe. We know from what beginnings Nature arises; how she orders the course of the heavens; by what successive changes she summons back the year; how she has brought to an end all things that ever have been, and has established herself as the only end of her own being. We know that the stars move by their own motion, and that nothing except the earth stands still, while all the other bodies run on with uninterrupted swiftness. We know how the moon outstrips the sun; why it is that the slower leaves the swifter behind; in what manner she receives her light, or loses it again; what brings on the night, and what brings back the day. To that place you must go where you are to have a closer view of all these things. "And yet," says the wise man, "I do not depart more valiantly because of this hope – because I judge the path lies clear before me to my own gods. I have indeed earned admission to their presence, and in fact have already been in their company; I have sent my soul to them as they had previously sent theirs to me. But suppose that I am utterly annihilated, and that after death nothing mortal remains; I have no less courage, even if, when I depart, my course leads – nowhere." "But," you say, "he has not lived as many years as he might have lived." There are books which contain very few lines, admirable and useful in spite of their size; and there are also the Annals of Tanusius – you know how bulky the book is, and what men say of it. This is the case with the long life of certain persons, – a state which resembles the Annals of Tanusius! Do you regard as more fortunate the fighter who is slain on the last day of the games than one who goes to his death in the middle of the festivities? Do you believe that anyone is so foolishly covetous of life that he would rather have his throat cut in the dressing-room than in the amphitheatre? It is by no longer an interval than this that we precede one another. Death visits each and all; the slayer soon follows the slain. It is an insignificant trifle, after all, that people discuss with so much concern. And anyhow, what does it matter for how long a time you avoid that which you cannot escape? Farewell. That department of philosophy which supplies precepts appropriate to the individual case, instead of framing them for mankind at large – which, for instance, advises how a husband should conduct himself towards his wife, or how a father should bring up his children, or how a master should rule his slaves – this department of philosophy, I say, is accepted by some as the only significant part, while the other departments are rejected on the ground that they stray beyond the sphere of practical needs – as if any man could give advice concerning a portion of life without having first gained a knowledge of the sum of life as a whole! But Aristo the Stoic, on the contrary, believes the above-mentioned department to be of slight import – he holds that it does not sink into the mind, having in it nothing but old wives' precepts, and that the greatest benefit is derived from the actual dogmas of philosophy and from the definition of the Supreme Good. When a man has gained a complete understanding of this definition and has thoroughly learned it, he can frame for himself a precept directing what is to be done in a given case. Just as the student of javelin-throwing keeps aiming at a fixed target and thus trains the hand to give direction to the missile, and when, by instruction and practice, he has gained the desired ability he can then employ it against any target he wishes (having learned to strike not any random object, but precisely the object at which he has aimed), – he who has equipped himself for the whole of life does not need to be advised concerning each separate item, because he is now trained to meet his problem as a whole; for he knows not merely how he should live with his wife or his son, but how he should live aright. In this knowledge there is also included the proper way of living with wife and children. Cleanthes holds that this department of wisdom is indeed useful, but that it is a feeble thing unless it is derived from general principles – that is, unless it is based upon a knowledge of the actual dogmas of philosophy and its main headings. This subject is therefore twofold, leading to two separate lines of inquiry: first, Is it useful or useless? and, and second, can it of itself produce a good man? – in other words, Is it superfluous, or does it render all other departments superfluous? Those who urge the view that this department is superfluous argue as follows: "If an object that is held in front of the eyes interferes with the vision, it must be removed. For just as long as it is in the way, it is a waste of time to offer such precepts as these: 'Walk thus and so; extend your hand in that direction.' Similarly, when something blinds a man's soul and hinders it from seeing a line of duty clearly, there is no use in advising him: 'Live thus and so with your father, thus and so with your wife.' For precepts will be of no avail while the mind is clouded with error; only when the cloud is dispersed will it be clear what one's duty is in each case. Otherwise, you will merely be showing the sick man what he ought to do if he were well, instead of making him well. Suppose you are trying to reveal to the poor man the art of 'acting rich'; how can the thing be accomplished as long as his poverty is unaltered? You are trying to make clear to a starveling in what manner he is to act the part of one with a well-filled stomach; the first requisite, however, is to relieve him of the hunger that grips his vitals. "The same thing, I assure you, holds good of all faults; the faults themselves must be removed, and precepts should not be given which cannot possibly be carried out while the faults remain. Unless you drive out the false opinions under which we suffer, the miser will never receive instruction as to the proper use of his money, nor the coward regarding the way to scorn danger. You must make the miser know that money is neither a good nor an evil; show him men of wealth who are miserable to the last degree. You must make the coward know that the things which generally frighten us out of our wits are less to be feared than rumor advertises them to be, whether the object of fear be suffering or death; that when death comes – fixed by law for us all to suffer – it is often a great solace to reflect that it can never come again; that in the midst of suffering resoluteness of soul will be as good as a cure, for the soul renders lighter any burden that it endures with stubborn defiance. Remember that pain has this most excellent quality: if prolonged it cannot be severe, and if severe it cannot be prolonged; and that we should bravely accept whatever commands the inevitable laws of the universe lay upon us. "When by means of such doctrines you have brought the erring man to a sense of his own condition, when he has learned that the happy life is not that which conforms to pleasure, but that which conforms to Nature, when he has fallen deeply in love with virtue as man's sole good and has avoided baseness as man's sole evil, and when he knows that all other things – riches, office, health, strength, dominion – fall in between and are not to be reckoned either among goods or among evils, then he will not need a monitor for every separate action, to say to him: 'Walk thus and so, eat thus and so. This is the conduct proper for a man and that for a woman; this for a married man and that for a bachelor.' Indeed, the persons who take the greatest pains to proffer such advice are themselves unable to put it into practice. It is thus that the pedagogue advises the boy, and the grandmother her grandson; it is the hottest-tempered schoolmaster who contends that one should never lose one's temper. Go into an elementary school, and you will learn that just such pronouncements, emanating from high-browed philosophers, are to be found in the lesson-book for boys! "Shall you then offer precepts that are clear, or precepts that are doubtful? Those which are clear need no counsellor, and doubtful precepts gain no credence; so the giving of precepts is superfluous. Indeed you should study the problem in this way: if you are counselling someone on a matter which is of doubtful clearness and doubtful meaning, you must supplement your precepts by proofs; and if you must resort to proofs, your means of proof are more effective and more satisfactory in themselves. 'It is thus that you must treat your friend, thus your fellow citizen, thus your associate.' And why? 'Because it is just.' Yet I can find all that material included under the head of Justice. I find there that fair play is desirable in itself, that we are not forced into it by fear nor hired to that end for pay, and that no man is just who is attracted by anything in this virtue other than the virtue itself. After convincing myself of this view and thoroughly absorbing it, what good can I obtain from such precepts, which only teach one who is already trained? To one who knows, it is superfluous to give precepts; to one who does not know, it is insufficient. For he must be told, not only what he is being instructed to do, but also why. I repeat, are such precepts useful to him who has correct ideas about good and evil, or to one who has them not? The latter will receive no benefit from you; for some idea that clashes with your counsel has already monopolized his attention. He who has made a careful decision as to what should be sought and what should be avoided knows what he ought to do, without a single word from you. Therefore, that whole department of philosophy may be abolished. "There are two reasons why we go astray: either there is in the soul an evil quality which has been brought about by wrong opinions, or, even if not possessed by false ideas, the soul is prone to falsehood and rapidly corrupted by some outward appearance which attracts it in the wrong direction. For this reason it is our duty either to treat carefully the diseased mind and free it from faults, or to take possession of the mind when it is still unoccupied and yet inclined to what is evil. Both these results can be attained by the main doctrines of philosophy; therefore the giving of such precepts is of no use. Besides, if we give forth precepts to each individual, the task is stupendous. For one class of advice should be given to the financier, another to the farmer, another to the business man, another to one who cultivates the good graces of royalty, another to him who will seek the friendship of his equals, another to him who will court those of lower rank. In the case of marriage, you will advise one person how he should conduct himself with a wife who before her marriage was a maiden, and another how he should behave with a woman who had previously been wedded to another; how the husband of a rich woman should act, or another man with a dowerless spouse. Or do you not think that there is some difference between a barren woman and one who bears children, between one advanced in years and a mere girl, between a mother and a step-mother? We cannot include all the types, and yet each type requires separate treatment; but the laws of philosophy are concise and are binding in all cases. Moreover, the precepts of wisdom should be definite and certain: when things cannot be defined, they are outside the sphere of wisdom; for wisdom knows the proper limits of things. "We should therefore do away with this department of precepts, because it cannot afford to all what it promises only to a few; wisdom, however, embraces all. Between the insanity of people in general and the insanity which is subject to medical treatment there is no difference, except that the latter is suffering from disease and the former from false opinions. In the one case, the symptoms of madness may be traced to ill-health; the other is the ill-health of the mind. If one should offer precepts to a madman – how he ought to speak, how he ought to walk, how he ought to conduct himself in public and private, he would be more of a lunatic than the person whom he was advising. What is really necessary is to treat the black bile and remove the essential cause of the madness. And this is what should also be done in the other case – that of the mind diseased. The madness itself must be shaken off; otherwise, your words of advice will vanish into thin air." This is what Aristo says; and I shall answer his arguments one by one. First, in opposition to what he says about one's obligation to remove that which blocks the eye and hinders the vision. I admit that such a person does not need precepts in order to see, but that he needs treatment for the curing of his eyesight and the getting rid of the hindrance that handicaps him. For it is Nature that gives us our eyesight; and he who removes obstacles restores to Nature her proper function. But Nature does not teach us our duty in every case. Again, if a man's cataract is cured, he cannot, immediately after his recovery, give back their eyesight to other men also; but when we are freed from evil we can free others also. There is no need of encouragement, or even of counsel, for the eye to be able to distinguish different colors; black and white can be differentiated without prompting from another. The mind, on the other hand, needs many precepts in order to see what it should do in life; although in eye-treatment also the physician not only accomplishes the cure, but gives advice into the bargain. He says: "There is no reason why you should at once expose your weak vision to a dangerous glare; begin with darkness, and then go into half-lights, and finally be more bold, accustoming yourself gradually to the bright light of day. There is no reason why you should study immediately after eating; there is no reason why you should impose hard tasks upon your eyes when they are swollen and inflamed; avoid winds and strong blasts of cold air that blow into your face," – and other suggestions of the same sort, which are just as valuable as drugs themselves. The physician's art supplements remedies by advice. "But," comes the reply, "error is the source of sin; precepts do not remove error, nor do they rout our false opinions on the subject of Good and Evil." I admit that precepts alone are not effective in overthrowing the mind's mistaken beliefs; but they do not on that account fail to be of service when they accompany other measures also. In the first place, they refresh the memory; in the second place, when sorted into their proper classes, the matters which showed themselves in a jumbled mass when considered as a whole, can be considered in this with greater care. According to our opponent’s theory, you might even say that consolation, and exhortation were superfluous. Yet they are not superfluous; neither, therefore, is counsel. "But it is folly," they retort, "to prescribe what a sick man ought to do, just as if he were well, when you should really restore his health; for without health precepts are not worth a jot." But have not sick men and sound men something in common, concerning which they need continual advice? For example, not to grasp greedily after food, and to avoid getting over-tired. Poor and rich have certain precepts which fit them both. "Cure their greed, then," people say, "and you will not need to lecture either the poor or the rich, provided that in the case of each of them the craving has subsided." But is it not one thing to be free from lust for money, and another thing to know how to use this money? Misers do not know the proper limits in money matters, but even those who are not misers fail to comprehend its use. Then comes the reply: "Do away with error, and your precepts become unnecessary." That is wrong; for suppose that avarice is slackened, that luxury is confined, that rashness is reined in, and that laziness is pricked by the spur; even after vices are removed, we must continue to learn what we ought to do, and how we ought to do it. "Nothing," it is said, "will be accomplished by applying advice to the more serious faults." No; and not even medicine can master incurable diseases; it is nevertheless used in some cases as a remedy, in others as a relief. Not even the power of universal philosophy, though it summon all its strength for the purpose, will remove from the soul what is now a stubborn and chronic disease. But Wisdom, merely because she cannot cure everything, is not incapable of making cures. People say: "What good does it do to point out the obvious?" A great deal of good; for we sometimes know facts without paying attention to them. Advice is not teaching; it merely engages the attention and rouses us, and concentrates the memory, and keeps it from losing grip. We miss much that is set before our very eyes. Advice is, in fact, a sort of exhortation. The mind often tries not to notice even that which lies before our eyes; we must therefore force upon it the knowledge of things that are perfectly well known. One might repeat here the saying of Calvus about Vatinius: "You all know that bribery has been going on, and everyone knows that you know it." You know that friendship should be scrupulously honored, and yet you do not hold it in honor. You know that a man does wrong in requiring chastity of his wife while he himself is intriguing with the wives of other men; you know that, as your wife should have no dealings with a lover, neither should you yourself with a mistress; and yet you do not act accordingly. Hence, you must be continually brought to remember these facts; for they should not be in storage, but ready for use. And whatever is wholesome should be often discussed and often brought before the mind, so that it may be not only familiar to us, but also ready to hand. And remember, too, that in this way what is clear often becomes clearer. Fortune favors the brave, but the coward is foiled by his faint heart. Such maxims need no special pleader; they go straight to our emotions, and help us simply because Nature is exercising her proper function. The soul carries within itself the seed of everything that is honorable, and this seed is stirred to growth by advice, as a spark that is fanned by a gentle breeze develops its natural fire. Virtue is aroused by a touch, a shock. Moreover, there are certain things which, though in the mind, yet are not ready to hand but begin to function easily as soon as they are put into words. Certain things lie scattered about in various places, and it is impossible for the unpracticed mind to arrange them in order. Therefore, we should bring them into unity, and join them, so that they may be more powerful and more of an uplift to the soul. Or, if precepts do not avail at all, then every method of instruction should be abolished, and we should be content with Nature alone. Those who maintain this view do not understand that one man is lively and alert of wit, another sluggish and dull, while certainly some men have more intelligence than others. The strength of the wit is nourished and kept growing by precepts; it adds new points of view to those which are inborn and corrects depraved ideas. "But suppose," people retort, "that a man is not the possessor of sound dogmas, how can advise help him when he is chained down by vicious dogmas?" In this, assuredly, that he is freed there-from; for his natural disposition has not been crushed, but over-shadowed and kept down. Even so it goes on endeavoring to rise again, struggling against the influences that make for evil; but when it wins support and receives the aid of precepts, it grows stronger, provided only that the chronic trouble has not corrupted or annihilated the natural man. For in such a case, not even the training that comes from philosophy, striving with all its might, will make restoration. What difference, indeed, – is there between the dogmas of philosophy and precepts, unless it be this – that the former are general and the latter special? Both deal with advice – the one through the universal, the other through the particular. Some say: "If one is familiar with upright and honorable dogmas, it will be superfluous to advise him." By no means; for this person has indeed learned to do things which he ought to do; but he does not see with sufficient clearness what these things are. For we are hindered from accomplishing praiseworthy deeds not only by our emotions, but also by want of practice in discovering the demands of a particular situation. Our minds are often under good control, and yet at the same time are inactive and untrained in finding the path of duty, – and advice makes this clear. Again, it is written: "Cast out all false opinions concerning Good and Evil, but replace them with true opinions; then advice will have no function to perform." Order in the soul can doubtless be established in this way; but these are not the only ways. For although we may infer by proofs just what Good and Evil are, nevertheless precepts have their proper role. Prudence and justice consist of certain duties; and duties are set in order by precepts. Moreover, judgment as to Good and Evil is itself strengthened by following up our duties, and precepts conduct us to this end. For both are in accord with each other; nor can precepts take the lead unless the duties follow. They observe their natural order; hence precepts clearly come first. "Precepts," it is said "are numberless." Wrong again! For they are not numberless so far as concerns important and essential things. Of course there are slight distinctions, due to the time, or the place, or the person; but even in these cases, precepts are given which have a general application. "No one, however," it is said, "cures madness by precepts, and therefore not wickedness either." There is a distinction; for if you rid a man of insanity, he becomes sane again, but if we have removed false opinions, insight into practical conduct does not at once follow. Even though it follows, counsel will none the less confirm one's right opinion concerning Good and Evil. And it is also wrong to believe that precepts are of no use to madmen. For though, by themselves, they are of no avail, yet they are a help towards the cure. Both scolding and chastening rein in a lunatic. Note that I here refer to lunatics whose wits are disturbed but not hopelessly gone. "Still," it is objected, "laws do not always make us do what we ought to do; and what else are laws than precepts mingled with threats?" Now first of all, the laws do not persuade just because they threaten; precepts, however, instead of coercing, correct men by pleading. Again, laws frighten one out of communicating crime, while precepts urge a man on to his duty. Besides, the laws also are of assistance towards good conduct, at any rate if they instruct as well as command. On this point I disagree with Posidonius, who says: "I do not think that Plato's Laws should have the preambles added to them. For a law should be brief, in order that the uninitiated may grasp it all the more easily. It should be a voice, as it were, sent down from heaven; it should command, not discuss. Nothing seems to me more dull or more foolish than a law with a preamble. Warn me, tell me what you wish me to do; I am not learning but obeying." But laws framed in this way are helpful; hence you will notice that a state with defective laws will have defective morals. "But," it is said, "they are not of avail in every case." Well neither is philosophy; and yet philosophy is not on that account ineffectual and useless in the training of the soul. Furthermore, is not philosophy the Law of Life? Grant, if we will, that the laws do not avail; it does not necessarily follow that advice also should not avail. On this ground, you ought to say that consolation does not avail, and warning, and exhortation, and scolding, and praising; since they are all varieties of advice. It is by such methods that we arrive at a perfect condition of mind. Nothing is more successful in bringing honorable influences to bear upon the mind, or in straightening out the wavering spirit that is prone to evil, than association with good men. For the frequent seeing, the frequent hearing of them little by little sinks into the heart and acquires the force of precepts. We are indeed uplifted merely by meeting wise men; and one can be helped by a great man even when he is silent. I could not easily tell you how it helps us, though I am certain of the fact that I have received help in that way. Phaedo says: "Certain tiny animals do not leave any pain when they sting us; so subtle is their power, so deceptive for purposes of harm. The bite is disclosed by a swelling, and even in the swelling there is no visible wound." That will also be your experience when dealing with wise men, you will not discover how or when the benefit comes to you, but you will discover that you have received it. "What is the point of this remark?" you ask. It is, that good precepts, often welcomed within you, will benefit you just as much as good examples. Pythagoras declares that our souls experience a change when we enter a temple and behold the images of the gods face to face, and await the utterances of an oracle. Moreover, who can deny that even the most inexperienced are effectively struck by the force of certain precepts? For example, by such brief but weighty saws as: "Nothing in excess," "The greedy mind is satisfied by no gains," "You must expect to be treated by others as you yourself have treated them." We receive a sort if shock when we hear such sayings; no one ever thinks of doubting them or of asking "Why?" So strongly, indeed, does mere truth, unaccompanied by reason, attract us. If reverence reins in the soul and checks vice, why cannot counsel do the same? Also, if rebuke gives one a sense of shame, why has not counsel the same power, even though it does use bare precepts? The counsel which assists suggestion by reason – which adds the motive for doing a given thing and the reward which awaits one who carries out and obeys such precepts is – more effective and settles deeper into the heart. If commands are helpful, so is advice. But one is helped by commands; therefore one is helped also by advice. Virtue is divided into two parts – into contemplation of truth, and conduct. Training teaches contemplation, and admonition teaches conduct. And right conduct both practices and reveals virtue. But if, when a man is about to act, he is helped by advice, he is also helped by admonition. Therefore, if right conduct is necessary to virtue, and if, moreover, admonition makes clear right conduct, then admonition also is an indispensable thing. There are two strong supports to the soul – trust in the truth and confidence; both are the result of admonition. For men believe it, and when belief is established, the soul receives great inspiration and is filled with confidence. Therefore, admonition is not superfluous. Marcus Agrippa, a great-souled man, the only person among those whom the civil wars raised to fame and power whose prosperity helped the state, used to say that he was greatly indebted to the proverb "Harmony makes small things grow; lack of harmony makes great things decay." He held that he himself became the best of brothers and the best of friends by virtue of this saying. And if proverbs of such a kind, when welcomed intimately into the soul, can mound this very soul, why cannot the department of philosophy which consists of such proverbs possess equal influence? Virtue depends partly upon training and partly upon practice; you must learn first, and then strengthen your learning by action. If this be true, not only do the doctrines of wisdom help us but the precepts also, which check and banish our emotions by a sort of official decree. It is said: "Philosophy is divided into knowledge and state of mind. For one who has learned and understood what he should do and avoid, is not a wise man until his mind is metamorphosed into the shape of that which he has learned. This third department – that of precept – is compounded from both the others, from dogmas of philosophy and state of mind. Hence it is superfluous as far as the perfecting of virtue is concerned; the other two parts are enough for the purpose." On that basis, therefore, even consolation would be superfluous, since this also is a combination of the other two, as likewise are exhortation, persuasion, and even proof itself. For proof also originates from a well-ordered and firm mental attitude. But, although these things result from a sound state of mind, yet the sound state of mind also results from them; it is both creative of them and resultant from them. Furthermore, that which you mention is the mark of an already perfect man, of one who has attained the height of human happiness. But the approach to these qualities is slow, and in the meantime in practical matters, the path should be pointed out for the benefit of one who is still short of perfection, but is making progress. Wisdom by her own agency may perhaps show herself this path without the help of admonition; for she has brought the soul to a stage where it can be impelled only in the right direction. Weaker characters, however, need someone to precede them, to say: "Avoid this," or "Do that." Moreover, if one awaits the time when one can know of oneself what the best line of action is, one will sometimes go astray and by going astray will be hindered from arriving at the point where it is possible to be content with oneself. The soul should accordingly be guided at the very moment when it is becoming able to guide itself. Boys study according to direction. Their fingers are held and guided by others so that they may follow the outlines of the letters; next, they are ordered to imitate a copy and base thereon a style of penmanship. Similarly, the mind is helped if it is taught according to direction. Such facts as these prove that this department of philosophy is not superfluous.